I can now say that I'm officially 19, yay! I love birthdays. Like LOVE THEM. As I think I've mentioned before, not just mine, but all of my friends, I find them so exciting! Of course, I especially love my own birthday. Even though I'm 19 I still wake up about an hour before we do presents... Shh don't tell... I had a fantabulous birthday with lots of presents from mum, dad (in spirit as he was in the USA), Alex and Cam. I have many new baking things which I will be trying out and posting about in the coming weeks, but for now I shall focus on the background of the cake. I decided I wanted to have a dinner party for the mutual friends that Cam and I have and I thought it would only be fitting to bake a cake. When I saw this recipe I knew it would be perfect. How could it not? The blogger behind Sweetapolita, Rosie, is very clever, I love reading her blogs and her recipes are amazing. 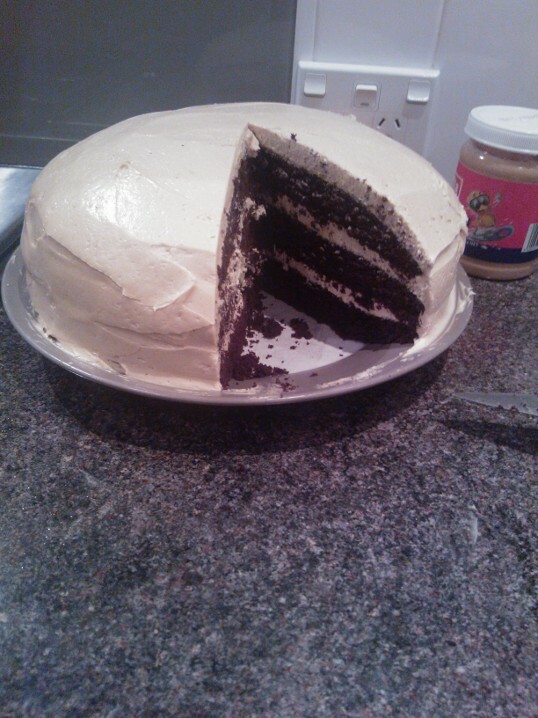 So when I saw her peanut butter frosting on a chocolate cake recipe, I knew that this would be perfect! Also, in reference to the take 2, Harriet was unfortunately again sick. I'm beginning to think she doesn't like me... ;) But the cake was still a success, there is just a heck of a lot of butter. ANd egg whites. Ginormous. But it was my birthday. You can never have too much butter (or eggs) on your birthday! Preheat oven to 180°C. Grease three 18-20cm round cake pans and line with baking paper. In the bowl of electric mixer, sift all dry ingredients. Add all remaining ingredients to bowl with the dry ingredients and with paddle attachment on mixer, mix for 2 minutes on medium speed and pour into prepared pans. If possible, use a digital kitchen scale and weigh the pans for even layers. The batter will be liquidy. Bake for 20 minutes and rotate pans in oven. The cakes are done when a skewer inserted into the centre comes out clean, approximately 30 minutes. Try not to over bake. Cool on wire racks for 20 minutes then gently invert onto racks until completely cool. To assemble the cakes, ice the top of one, place another on top, ice that, then the final cake and ice the top and the sides. 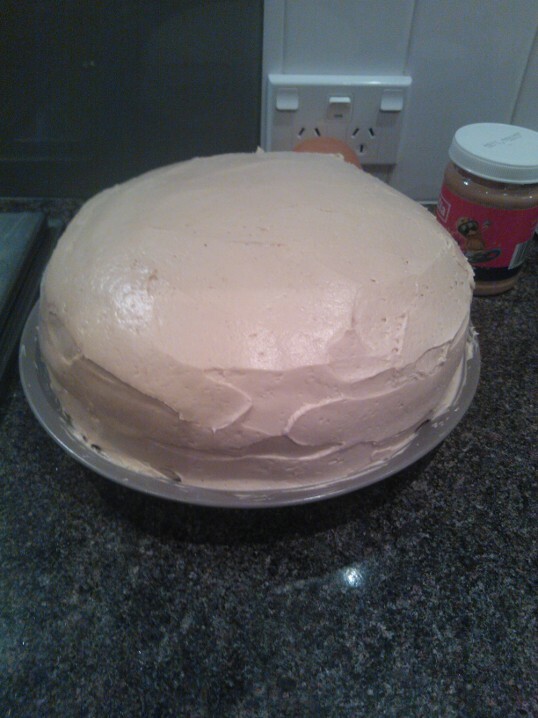 Be generous with the buttercream as you will have lots and if you put a whole mound in the middle and spread if from there then you can avoid doing a crumb coat! Wipe the bowl and whisk attachment of an electric mixer with paper towel and lemon juice, to remove any trace of grease. Place the egg whites and brown sugar in the bowl (or another if you don't have a saucepan the right size) and simmer over a pot of water (not boiling), whisking constantly but gently. Whisk until temperature reaches 140°F, or if you don’t have a candy thermometer, until the sugar has completely dissolved and the egg whites are hot, about 8 minutes if you used room temperature egg whites. About 12 if they were cold. Just be sure you can’t feel any sugar crystals when you rub a small bit between your fingers. Place the bowl back into the mixer, and with whisk attachment attached, begin to whip until the meringue is thick, glossy, and the bottom of the bowl feels neutral to the touch (this can take up to 10 minutes or so). Make sure your meringue is completely cool before adding butter–this may take much longer than you expect, but if the meringue is very stiff and still warm, just turn off mixer and wait until it has cooled. Switch over to paddle attachment and, with mixer on low speed, add softened butter in chunks until incorporated, and mix until it has reached a silky smooth texture (if curdles, keep mixing on medium-low and it will come back to smooth). Add vanilla and peanut butter, and continue to beat on low speed until well combined. Mine went weird after adding the butter but back to normal after adding the peanut butter, so don't panic if that also happens to you!